People like me, who spend their evenings haunting vast, baroque dining establishments, puzzling over crowded, multipage menus and gorging (or trying not to gorge) on remorselessly similar variations of foie gras or molten-chocolate cake, often dream of escaping to a certain kind of restaurant. This imaginary restaurant is a neighborly place, tucked on an out-of-the-way street, where waiters aren’t excessively fawning and the prices aren’t excessively high. The room is big enough not to be poky, but not so big that you have to shout to be heard. There are no trendy circular lampshades hanging from the ceiling, no freakishly large flower arrangements sprouting to the sky. There is a bar to dine at, and possibly two. The food is various but not busy, and prepared in a way that highlights the ingredients instead of the vaunted skills of an egotistical chef. It’s a restaurant, in other words, where one would be happy to dine on an off night, on his own nickel, when it wasn’t his dubious professional duty to devour everything in sight. Bellavitae, which opened not long ago on a nondescript corner of Minetta Lane and Sixth Avenue in the Village, is this kind of place. The modest little Italian restaurant occupies a single long room, with a bar in the back for eating and one in the front for sipping wines. The floor is covered with wide wood planking, and the ceiling with countrified beams. The proprietor, Rolando Beramendi, supplies many of the city’s leading Italian restaurants with their fancy imported olive oils, pastas, and vinegars, and Bellavitae (the name is a mix of the Latin for “beautiful life” and “beautiful vines”) is designed to showcase these rarefied products. So there are jars of chestnut honey from Lake Como ($17) set up along the walls, slim bottles of ancient Leonardi balsamic vinegar (a 100-year-old bottle costs $500), and little bags of baldo and arborio rice ($4 and $4.75, respectively) supplied by a contessa from the Piedmont region of Italy. There’s even a photograph of the rice-growing contessa on the wall, along with a rogues’ gallery (grizzled vintners, merry honey-makers, etc.) of Mr. Beramendi’s other suppliers. If all this sounds a little precious, well, that’s because it is. Bellavitae is already a favorite haunt of delicate, food-obsessed souls who murmur over the quality of the green Nocellara olives (from Sicily) and the radicchio, which is state-inspected and picked by hand in the hills around Treviso. Unlike at some of the city’s other high-minded, ingredient-conscious foodie palaces, however, the menu here is presented casually, within the context of a familiar culinary tradition, and it’s relatively cheap. It’s the kind of straightforward, unfussy food that would send you into paroxysms of tourist glee if you came across it at a trattoria in the hills around Treviso, say. Like little pewter cocktail bowls filled with meatballs fried in extra-virgin olive oil, for instance, or grilled figs from Calabria bundled in strips of pancetta. There are toasty crostini also, layered with Gorgonzola drizzled with that chestnut honey from Lake Como or puréed chickpeas splashed with Sicilian olive oil and flakes of bottarga or stacked with chicken livers mashed, in the Tuscan style, with anchovies, garlic, and a trace of white-wine vinegar. I liked the chicken-liver crostini the best, and would have ordered another platter or two if my cholesterol-fixated wife hadn’t threatened to grapple me to the floor. I also liked the figs, and the fried risotto balls, which are meager in size (they look like Tater Tots) but laced with nice bits of tomato and mozzarella. Before the heftier courses arrive, it’s also possible to indulge in a good, milky buffalo mozzarella tangled with prosciutto, and a variety of chaste vegetable dishes designed, in high Greenmarket fashion, to be admired as much for their beauty as for their taste. I sampled a decent salad made with perfectly spiky wild arugula leaves, and a wet, slightly wan-tasting plate of chickpeas flavored, it seemed, with nothing very much at all. The very good, very green fava beans are served uncooked, with nuggets of pecorino cheese, and then there’s the fancy Treviso radicchio, which isn’t bulbous like radicchios of my acquaintance, or even terribly bitter, but soft, almost sweet (here it’s flavored with more balsamic), and twirled with ribbons of grilled pancetta. Unlike with the majority of brawny, overstuffed Italian restaurants these days, there are only four pasta dishes on the menu at Bellavitae, and four secondi courses, and they are more or less interchangeable as main courses. All the pastas I sampled were good, especially the thin tubes of egg garganelli tossed with an authentically beefy Bolognese ragù, chewy triangles of farro-based “pizzichi” pasta smothered in a rich porcini-mushroom-and-pancetta sauce, and a well-cooked bowl of bucatini piled with an assortment of shellfish. Among the secondi, my sliced steak could have been sliced thicker, and the tepid marinated sardines were obliterated by too many sweet onions. But the simple oven-baked pork fillet tasted fine, as did the chicken cacciatore, which was swimming in a rich tomato sauce filled with black Ligurian olives. There’s also a superior fritto misto, made with hunks of rabbit on one evening I visited and cod on another, and served, both times, with segments of fennel rolled in semolina and crunchy fried slices of Meyer lemon. The menu changes often at Bellavitae, but many of the more exotic ingredients (extra-virgin olive oils, caperberries from Sicily, etc.) are constant, and many of them are for sale. The prices of these items are listed on the back of the menu, and some of the waiters hawk them a little too profusely. But this didn’t seem to faze the eclectic crowd, which included, on one of the nights I dropped in, several gigantic members of the New York Giants football team, all taking prim bites of pasta and squinting curiously at the labels of obscure Italian wines. Presumably these discerning gentlemen enjoyed the desserts, which are unfussy and agreeably Italian. There are wedges of spongy panettone, a dense slab of chocolate semifreddo dribbled with hazelnut liqueur, and a creamy, perfectly wobbly panna cotta doused with a grape essence called saba. Best of all are the gelati, which come drowned in espresso or infused with lemon marmalade and a mini shot of grappino (grappa flavored with Meyer lemons). Taste them delicately, like we weary gourmet professionals are taught to do, or do the natural thing and devour them whole. Hours: Tuesday through Friday, 6 P.M. to midnight. Saturday and Sunday, noon to midnight. 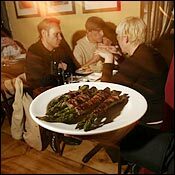 Prices: Appetizers, $4 to $11; Entrées, $12 to $19. Ideal Meal: Grilled radicchio with pancetta, egg garganelli with bolognese ragù, pan-fried saffron risotto, rabbit fritto misto, lemon marmalade gelato with grappino. Note: Italian wines can be overpriced and impenetrably complex, but the list here comes with informative little paragraphs on the different grapes and producers.